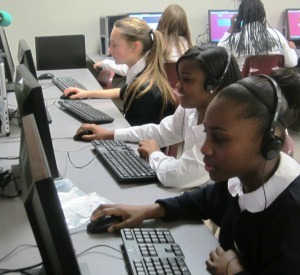 Students in second through eighth grade receive weekly instruction in computers, including Google documents, spreadsheets and presentations. Keyboarding, mouse control, research, and internet browsing instruction is also given. Students in third through eighth grades benefit from an Internet Safety curriculum entitled “USA-SOS (Safe Online Surfing) Internet Challenge” to help students become responsible cyber citizens. In addition to Computer class, students visit the computer lab with teachers to work on projects related to curriculum in other subject areas.